Roaming the Countryside: "I think he had that surgery just so he could get the cane." "I think he had that surgery just so he could get the cane." 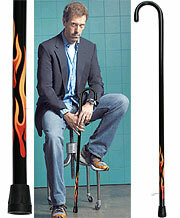 If you've ever watched HOUSE on the FOX network, then you are probably familiar with his sport jacket, t-shirt, torn jeans, and of course... his cane. I have admired the way his character wears the cane without apology. And so, after having a surgical procedure on the bottom of my right foot... I figured, why not? I hobbled my way out of the store and immediately met the eyes of my laughing and smiling wife. As I dragged my bum leg into the car, I heard her cough out between laughs, "well, of course you would." As my life would have it, this Sunday involved an announcement at church regarding our mission in Guatemala. I absolutely love these last few days as we near the horizon. I am consumed by the desire to get there and to begin taking steps into the summer. I somehow can feel the future in my hands. We began counting down the days last July... 300 days ago. My surgery finds me forced to sit still and unable to drive. The timing was perfect however for me to sell my car and so I concentrate on preparation via Skype, email, telephone, and Rosetta Stone. Our 2 vehicles await us, we are enrolled to begin with 4 weeks of language school in Antigua, we have an apartment rented there for that time, Caleb & Aleks are scheduled to go to Camp Guamiski (a camp for missionary kids), they are also enrolled in the Christian Academy where Kellie will volunteer, my role is becoming clearly defined, passports, plane tickets, and suitcases are secured and in position! Standing where we are now and looking back across the landscape of these past few years is absolutely breathtaking. The path of our lives is simply the shaping of the hands of God. He gave us the vision... we began walking... and He has indeed moved mountains. Since the spring of 2012 our family has travelled to China (adoption), Texas (training), Guatemala twice, lived in my parent's basement and at Kellie's parents upstairs. From here we will stay at Mimi's house for a few days, then move to Antigua for a month, move to the house next door to Mimi's House, and will stay there as we adjust to the culture of Guatemala. This past year has been incredible. We know God has used these days to prepare us for the journey to come. I think we have learned to enjoy each step of the way. We have found joy and happiness in a lot of unexpected places. Even in a busted foot and a fancy cane. While I did not have foot surgery just so I "could get the cane," I certainly am not going to let the opportunity pass me by! Ha! opening our home to the lost and hurting of Guatemla. So then, I won't be Dr. House, but I can be a pastor and missionary who lives in SHEPHERD HOUSE!